Getting started with RCM is easy and fast. If you need a new roofing website, we can get your site underway immediately. If you need SEO to get your site ranking in your market, we can get started right away. SEO takes time to build, but you have to start sometime and RCM has the portfolio and track record to get you there. If you need Social Media management—to get your company posting and growing with new awareness and likes—you need RCM. If you just need a basic website up to get started, we have sites that can quickly get you covered. If it is time for you to upgrade your site to a truly professional site, we have the experience, portfolio and talent in-house (not outsourced!) to build a fantastic looking professional roofing website. If you would like to talk about your overall strategy, we can give you a complete diagnostic analysis of your current marketing status. With this data we develop your custom marketing strategy for success. Our marketing systems are based on proven advanced marketing fundamentals that will get you in front of great leads and ahead of your competition. Our proven formula becomes YOUR unique and distinctive marketing attack. Ready to “Blow the Roof Off the Competition”? Call us today at 888-474-7276. Running a roofing company is a lot of work. As a CEO or General Manager you have a lot to keep track of. Let RCM take care of all the marketing details and management. You know the business of roofing. 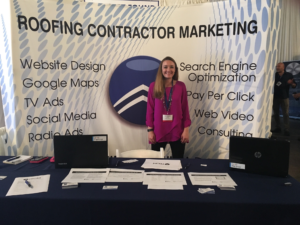 We know the business of roofing contractor marketing. Give us call to find out how we can help. Call 888-474-7276 today.